Summertime is here, and the waterfront sunsets are yours for the viewing. Norfolk’s array of outstanding sunset viewing locations are all exceptional in their own way. Marvel at the beautiful red, orange, yellow, pink and purple hues at everyone’s favorite time of day. Watch from a rooftop bar, or down by the bay. OV Fishing Pier – At the Ocean View Fishing Pier, you aren’t just watching the sunset, you are essentially a part of it. The pier’s restaurant, now open through summer, has an open rooftop deck loaded with lifeguard chairs for out-of-this-world sunset viewing. 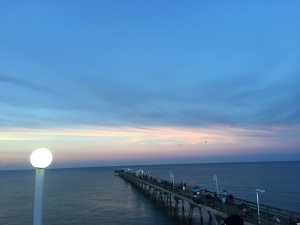 The OV Fishing Pier restaurant offers fresh seafood to pair with the stupendous sunset experience. 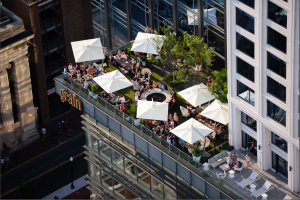 Grain – Located in the Hilton Norfolk’s The Main, Grain is a rooftop bar with one of the best selections of craft beer in Norfolk. This scene-setting destination is the perfect place to watch the sunset, due to its terraced patio with spectacular views of the Elizabeth River. Grain is a great place to unwind, have a cold beer and bask in the sweet summer sunset. The Hermitage – Join the Hermitage in celebrating summer with their Sunsets on the River events, every other Thursday from May 11 to August 3. Relax on the shoreline and listen to live music by the region’s hottest bands. Enjoy drinks from a cash bar featuring craft beer and wine, and grab some grub from a variety of food vendors that will be on location. The Waterside District – Norfolk’s new Waterside District is the place to be at sunset! Grab a bite and a couple drinks for a 5-star sunset experience at one of Waterside’s restaurants. Waterside offers outside seating, giving you the perfect view of the sunset, guaranteed. Town Point Park – Located in Downtown Norfolk, Town Point Park provides eight acres of peaceful outdoor space, nestled right on the banks of the beautiful Elizabeth River. Sit out and enjoy the stunning sunset view from Town Point Park while watching sailboats floating by on the shimmering water.